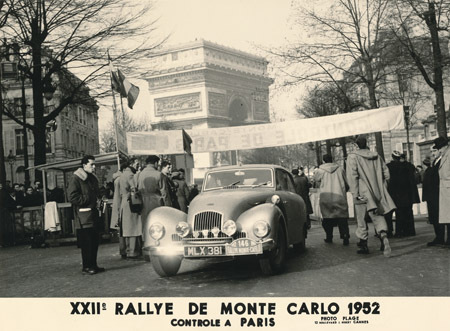 There's probably no better way to commemorate Sydney Allard's win in the 1952 Monte Carlo Rally than by posting a firsthand account of their ordeal. The author is unknown, but it's assumed to be either Sydney or Tom Lush. We've also included photos of the rally that we doubt you've ever seen. Enjoy! The crew for this Rally consisted of Sydney Allard, Guy Warburton and Tom Lush, and the crew arrangements were that Sydney and Guy should share the driving and Tom to be responsible for navigating and time keeping. The same crew had done the Rally previously and this arrangement had proved satisfactory. We selected Glasgow as our starting point; the alternative starting places in Europe meant too long a time away from the office desk, and when the starting list was published we found we were the last but one to leave, there being 72 people; in front of us. Mrs. Allard and her sisters, who wore also driving in an Allard, were 15 numbers ahead of us and this order was of course kept until their unfortunate retirement some 300 miles from Monte Carlo. We left Glasgow at 2.30 p.m. on Tuesday, January 22th, our first time control be Llandrindod Wells, Wales, where we were due at midnight. The weather conditions between Glasgow and Carlisle were fairly bad, the roads being covered in snow with patches of ice, and these conditions were again met some 50 miles from Llandrindod - it was on this last section that we saw our first casualty, which was the roar end of a competitor's car sticking out of a ditch. We learned afterwards that he got going without loss of marks for lateness. From Wales we headed for Folkestone, where we were due at 8 a.m. and we, together with all the other Glasgow starters, reached the quayside and were loaded on the boat, without any loss of marks. The Channel crossing was accomplished without trouble, and landing formalities, etc. were quickly completed and we were soon on our way to the first foreign control at Lille, without undo delay. From Lille, we turned northwards towards the next control at Liege and from there northwards again into the flat lands of Holland. We crossed over the new Arnhem in the early hours of the morning and were in the control at Amsterdam in time for a very early breakfast. 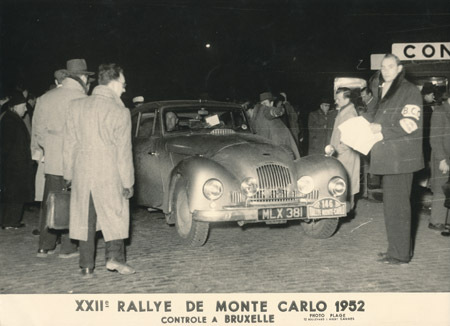 It was here that we joined up with the competitors from some of the other starting controls, and for the first time we began to see foreign makes of cars bearing the registration plates of most of the European countries. An amusing incident occurred at this control. When we came to get back into our car, we were horrified to see that somebody had painted an enormous greyhound on the side. 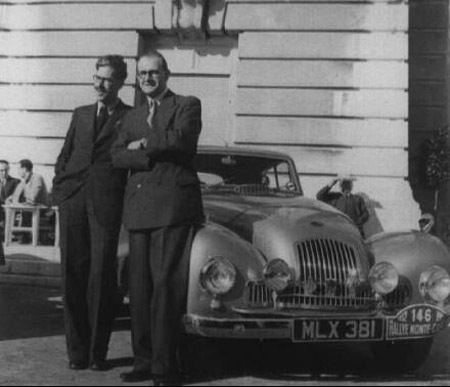 Rather annoyed (although we could do nothing) and it was not until we attempted to unlock the car and found our key would not fit, that we discovered it was in fact not our car but another Allard, identical in color and appearance, that had started from Norway. We had a lot of fun over this coincidence during the rest of the Rally when we watched other people making the same mistake. The weather so far had been dry and cold but nothing had yet occurred which could affect our time keeping. From Amsterdam we turned southward through Antwerp, Brussels and Reims to Paris. We were escorted from Paris by motor-cycle policemen, who led the cars in convoy to the outskirts of the city; the policemen took the opportunity to enter thoroughly into the spirit of the thing and our average speed for the short distance through the Paris traffic was very high indeed! Just south of Paris, we turned off the main road, which until now had been used for the entire route, and for the first time made our way over secondary roads towards the mountains which lay ahead. At the Bourges control which lay in the valley, we were told that the roads ahead were deeply snow-bound and that heavy snow was falling on the mountains. We pressed on, travelling as fast as possible because we knew that the critical part of the Rally now lay ahead. The snow was being blown horizontally against the windscreen, and thick patches of fog made visibility extremely poor. The width of the road was considerably reduced by the high snow banks on either side, and this made passing a matter of awaiting one's chance at a wider section, or perhaps a bend, and then passing on without hesitation. This was a very interesting procedure, as one never quite knew what lay around a bend. We covered all these sections without loss of time, although the last one from Le Puy, down through the Rhone Valley to Valence, a distance of some 80 miles was completed with only 60 seconds to spare. This was in fact where most of the other competitors lost marks, and we were the only Glasgow starter to get through on time. 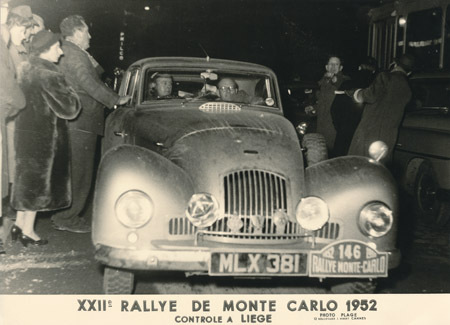 The rest of the run to Monte Carlo was uneventful, although the roads were snowbound and we arrived at 1.30 p.m. on Friday, having covered a little over 2,000 miles in three days and nights. The deciding factor in the Rally was a special average speed test, which was to be held over a 50 mile circuit on the Sunday, and realizing its importance we went straight out to the circuit after we had signed off, and snatched a quick bath. We were naturally very tired, but we drove up and down the winding section until about 9 p.m. when sleep dulled our senses to an extent where it was useless to stay out any longer. After an early breakfast on Saturday, we went out on the circuit and spent the whole day going round, memorizing the important landmarks and positioning of the kilometer stones. We had fitted to the cars a special recording instrument which theoretically showed when the car was maintaining its required speed of 28 m.p.h. but which in it was rendered inaccurate by the terrific wheel-spin on the ice-bound hairpin bends. We therefore evolved a scheme of allocating a time at which the car should pass each kilometer stone and the navigator was to count off the seconds, so that the driver could adjust his speed to pass the stone at the exact time called out. There were some seventy stones round the circuit, working out the time table was quite a long job, and we were very happy when Stanley Sedgwick of the Bentley Drivers' Club offered to draw this out for us while we continued our practice runs. During the evening we were interested to see various competitors making their own identification marks on trees, marking posts etc., and we thought it would be most amusing to reproduce every sign at a different place, thereby causing a certain amount of confusion! However, we had not the time or facilities for doing this, and in the early hours of Sunday morning, when the whole crew was confident that they had a mind picture of the complete circuit, we retired to bed. When we awoke on Sunday morning we were horrified to find the rain pouring down, for this meant heavy snow at the high altitude of the mountain circuit. We were led in convoy from the closed car park to the start of the test and were then dispatched at one minute intervals. The whole area was covered in several inches of snow and picking out our land marks was extremely difficult. The road surface was extremely slippery and at one hairpin bend we skidded into a stone wall and badly buckled a front wheel. We did not stop, and proceeded on our way, not quite knowing exactly how much damage had been done, and hoping that the steering connections would not suddenly part at an inconvenient time. All the competitors had finished the test by lunchtime and we spent the afternoon waiting for the results to be published. 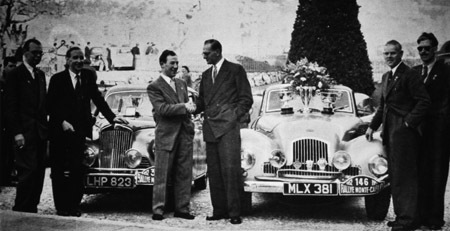 We were having tea when the news came through that we had won the Rally, with Stirling Moss - in a Sunbeam Talbot - second. 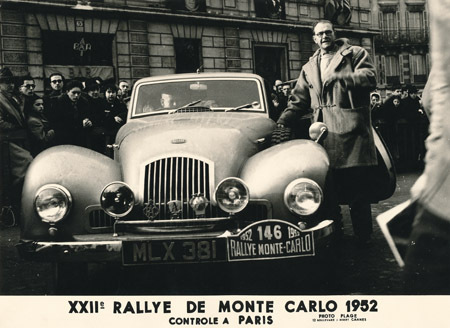 The final results were published, British cars occupied five of the first six places, and this, together with the fact that the Allard was the first British car to win the Rally for 21 years, led to a great deal of jubilation amongst the crowds of British people in Monte Carlo. On arrival back in England, it was extremely pleasing to note the spirited public acknowledgement of our success. The reception given to all three members of the crew - and to the car! - was loud and enthusiastic wherever we went, and we can say that the friendly warmth of people everywhere was greatly appreciated. We were made to feel we were responsible for a job extremely well done, and such was the manner in which so many of these sentiments were expressed that we were left with the feeling that we should like nothing better than to have history repeat itself within the shortest possible time.